The marine Turtle Lighting Ordinance was adopted on March 2, 2011. The nesting season is from March 1 through October 31. 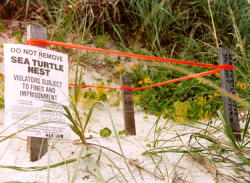 Certain types of artificial lighting have impact upon nesting turtles and hatchlings. The CRA HIP and PIP programs allow turtle lighting improvements as an eligible expense. The HIP and PIP programs are available to hotels, motels, and other commercial establishments. These programs allow reimbursement of a portion of the expense to upgrade lighting. Property owners are required to implement measures not involving any capital expenditures (such as turning off lights and closing drapes) by March 2015. New or existing development having secured a permit from DEP that includes an approved lighting plan for turtle protection shall be exempt from the Ordinance provided that all lights are in compliance with the lighting plan.